The Perkins family have seen success across all their ventures, the eponymous fine-dining of their flagship, the wedding venue, Carriage Hall and the popular tapas bar Escabeche in West Bridgford. On arrival the trepidation of the dark driveway to the collection of buildings in Plumtree quickly gives way to the simple comfort of Perkins. An open plan area starts with a couple of leather armchairs that look ideal for a pre-meal drink. This flows into to the light, spacious dining room that was once a Victorian railway station. There is a fixed price menu at £18.95 for 3 courses, available during the week, with a la carte available throughout. Some bread in the form of chilli focaccia arrived whilst decisions were being made. In itself the flavour was good, though I found it jarring against the butter that was served with it, oil would have been more fitting. The fixed price options didn’t quite excite me so I ended up choosing from the main menu. 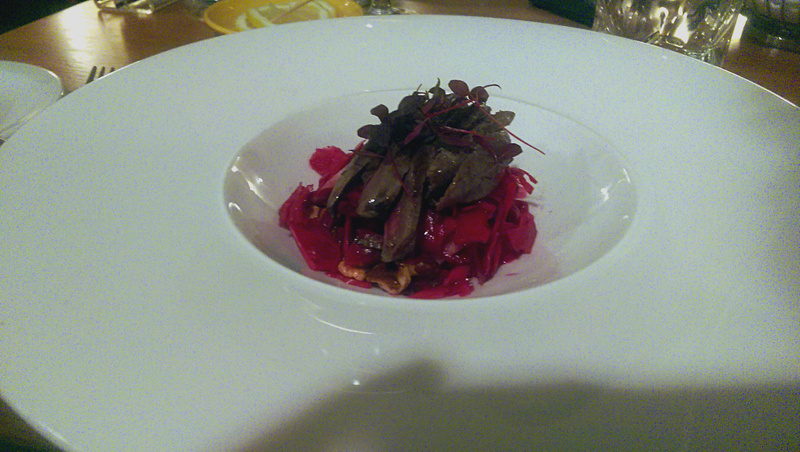 Starters ranged from £5.50 for a soup to £8.50 for the dish of my choosing, wood pigeon. The bird itself was pretty well cooked as it can easily be overdone. The cabbage/pear/walnut salad was a little over vinegared, whether it be through a dressing or pickling of the cabbage. It needed something else too to bring things alive, a sweet jus would be the usual accompaniment but the sharp salad wasn’t quite the perfect pairing. I’d like to make a little whinge too about the crockery – why they felt the need to station my starter in a relatively deep bowl I’m still not quite sure. Cod cheeks that a friend ordered were demolished in a new record time. I was reliably informed they were very good, that good I wasn’t allowed to try them. The rudeness of my friend aside, I did get to enjoy the mushroom soup from the fixed price menu which was everything you could ask for, a good thick texture and that distinctive woodland flavour. I’d gone for a gamey evening and with duck (£18.50) up next and we were on safe ground, and on a plate. Presentation wasn’t anything special, though looks were quickly forgotten when I tucked into the perfectly pink and stunningly tender duck. The combination was classic, black cherries in a rich, fruity jus. A crispy rosti provided texture with some shredded brussel sprouts bringing a touch of freshness and greenery. An apple fritter dessert was the prettiest dish of the night, as well as being technically good. I’d love to tell you how much it cost but for some reason their website doesn’t list desserts and I lost my receipt! They were between £5-7 if my memory is correct. 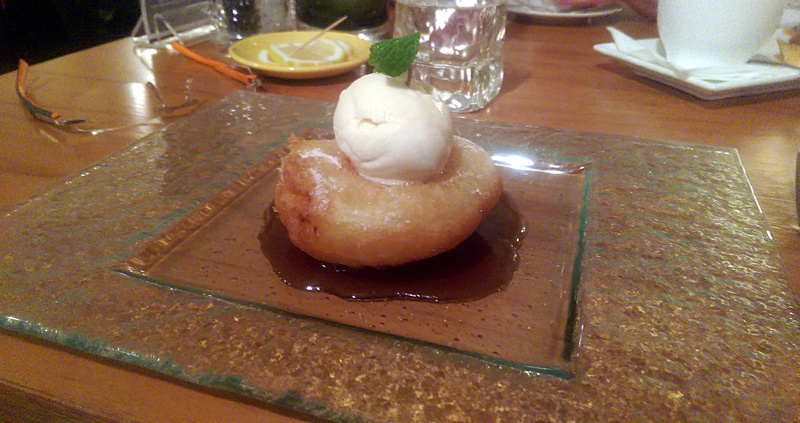 The batter surrounding the apple was light and crispy, a condensed milk ice cream and toffee sauce particularly decadent. Comparisons will inevitably be drawn against the likes of World Service, Harts and La Rock. They serve similar dishes at similar prices. I’ve eaten at all of these and the most enjoyable dish I have had at any was tonight’s main course. The setting is different with its competitors a little more contemporary, Perkins certainly more traditional. 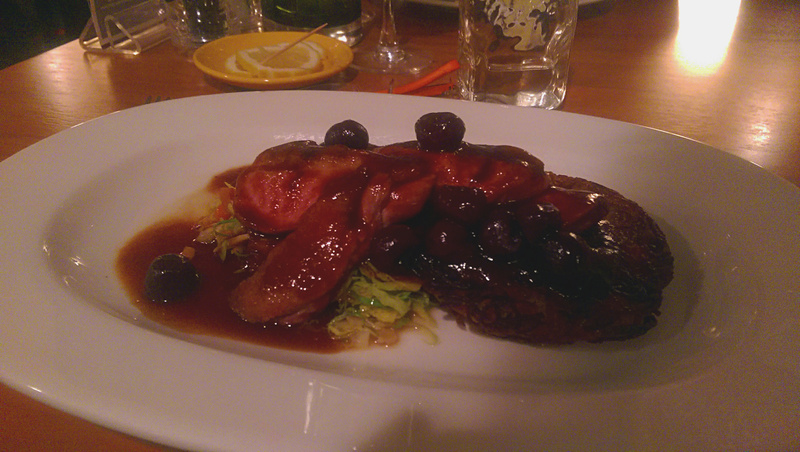 The meal wasn’t quite consistently excellent but it was worth a journey further than Plumtree for that duck alone.